I was poking around the PubMed database as I do, to relax. All that information gives me a sense of peace and hope. In both studies, the animals were injected with other substances besides Vitamin C, different in each study. The rats and rabbits healed. Wow. I had nearly all my arthritis heal, which I still cannot believe. I was not expecting that, I was only hoping things would not get worse. Was it from injecting so much ascorbic acid? You know because you have been reading my blog that I have been injecting Vitamin C (now the drug Ascor® made by McGuff Pharmaceuticals) everyday for six years for my rotten case of Hypermobility Ehlers-Danlos Syndrome. Accidental discovery with my doctor, that it gave me massive relief from hEDS. Don’t get same results from oral C. Looks like my rare genetic disorder interferes with my ability to handle ascorbic acid properly. No one knows but me. And now you. Unlike the rats and rabbits, I am not injecting C into injury sites. I do intramuscular injections of ascorbic acid into my fatty backside where it is slowly absorbed and spread throughout my body. Here I am self-injecting at the fabulous W Las Vegas, which sadly is no more. Empty prescription bottle for needles when I travel. This room so fabulous, I felt like Madonna in Truth or Dare. It smelled like cigarette smoke, as does all of Las Vegas, which is not fabulous. You have to launder absolutely everything you brought, even if you didn’t wear it. Wait, what’s that on the ceiling? Where’s my entourage and glam squad? I went from totally disabled, too sick and tired to function, to off all pain meds (I was on morhpine, Vicodin and Soma everyday). I went back to work, with energy and endurance I never had in my life. Healing took time. Let me repeat that. Healing took time. Recovery from long-term opiates was pretty much impossible but that’s another story, and this post is already too long. I still am discovering what I can do. Life is a new adventure. Trying what used to destroy me has been so scary but 100% successful. I meet the new diagnostic criteria for Hypermobility Ehlers-Danlos Syndrome. You, too? Then frequently injected Ascor over the long-term should help you as much as it has helped me, as we might have the same genetic cause, the exact same disease. If you have another kind of EDS, Hypermobility Spectrum Disorder, Marfan Syndrome or another connective tissue disorder, who knows if injecting Ascor would help. It might be worth trying if your suffering is too much. Everyone knows Vitamin C is necessary for collagen synthesis and is the catalyst for countless processes in the human body. Per the studies above, C loading seems to heal tendons and cartilage as well. You will need a prescription from your doctor. I’ve had no side effects from Ascor, except the burning from the shot. Ouch! But I got used to them after a few months of injecting everyday. Hang in there. Recently I found a way to make the C injections hurt a lot less. I am still experimenting, trying to find what works best so I can write a thorough post for you. It’s coming. One possible side effect from C loading is a kidney stone. I just had an abdominal ultrasound last week, no stones in site. Phew! This dose of Ascor, this frequency of injections, may be more than I need, but I feel great. I am strong, I heal, and I recover. I never crash. Why not stick with it. I am so lucky not only that Dr. Plance stumbled on this, but that Ascor is cheap and safe, that intramuscular injections of C is just so simple a thing to do. Do you know what a complete nightmare it is to treat a rare genetic disorder? (See this article How are genetic conditions treated or managed?) Or talk to someone with cystic fibrosis, phenylketonuria, muscular dystrophy or missing an immune system gene. I am grateful for my burning C shots every! single! day! When I was at my worst with Ehlers-Danlos, the internet was a baby. MCAD (Mast Cell Activation Disorder) was not a word we knew. Mast cells are immune system cells intertwined with collagen cells. Curious about severe MCAD with EDS? Learn from Arielle and Hospital Princess Cheyanne. 💕💕💕to you both and anyone suffering with MCAD. I notice a trend that many EDSers blame mast activation for their fatigue and pain symptoms. Vitamin C downregulates mast cells. (See this article Vitamins and mast cells.) Is that why I feel better? The C loading by intramuscular injection is doing so much more. My connective tissue is stronger. From six years of daily Ascor shots plus exercise to stimulate my collagen to heal plus time for it to repair better, I am less flimsy. Yesterday, my physical therapist rated my head-neck wobbliness at 5 on a scale of 1-10. Best! Compliment! Ever! I have had dramatic rosy-red cheek flushing from time-to-time since childhood. I get stress rashes occasionally, especially when I feel severe anxiety, twinged with a special sense of overwhelm and defeat. Sometimes they can be painful. They usually go away in a half hour or so. I don’t bother taking an antihistamine. Those drugs burden the brain, causing brain fog and fatigue, so I’d rather not. I do not have any autoimmune disorders, for which I am grateful. Per lab work my inflammation levels are nice and low. Very grateful for that. I try to keep my weight down as this helps inflammation in the body. I use the long-forgotten, old-fashioned method of weight management known as eating a little less. I know, sounds crazy. The dermatologist told me not to rub or put heat on an area with a stress rash, as that will stir up the mast cells more. Only once did I end up in the ER with hives and face and throat swelling. That IV of benadryl was the best. The allergist concluded it was stress induced. Here is an interesting study: Acute stress modulates the histamine content of mast cells in the gastrointestinal tract through interleukin-1 and corticotropin-releasing factor release in rats. I try not to suppress my feelings, as it seems to make my rashes worse. Better to openly admit to myself how helpless I can feel. When I was at my worst with Ehlers-Danlos, I used to cry every night after dinner, from all my pain and frustration of watching my life go by while I could do nothing. Mr. Pennington sat there listening. Not good times. Apparently, the darkness of my skin inhibits mast activation. See this article Inhibition of mast cell degranulation by melanin.) Haven’t you noticed the worst masties tend to be very fair complected? My dark olive skin came from that 1% Greek ancestor, likely a beautiful Mediterranean woman the Vikings kidnapped and brought back to Norway, as Vikings do. I get a wicked tan. I must drink salty water all day. I have had repeated blood and urine analysis of my electrolytes, and I am unable to hang onto salt. Salt depletion is a tremendous burden on the body, causing low blood pressure and fatigue, and also bone loss. Yikes. Naltrexone is the most amazing drug that no one is using. I credit this drug with healing my brain from a lifetime of pain overload and oversensitivity. It blocks the opiate receptors briefly, causing a healing response, kinda like exercise. It tones up the brain, making it more resilient and sharper. Big doses knock down that EDS anxiety better than low. I ❤️ naltrexone. I needed tons of physical rehabilitation, to correct my posture and get strong. I could only do it because of the relief I got from injecting Ascor. It makes my body able to recover and benefit from exercise. Getting strong took time and dedication. Fixing my back and neck posture improved my nervous system function. The spinal cord is the communication line of the body. Best to protect it. I keep my spine and big joints stable and strong by applying the Gokhale Method and mastering the TRX Suspension Trainer. I have had a lot of physical therapy for my ankles and feet, and occupational therapy for my hands. I exercise nearly everyday, some weights, maybe kettlebells, vibration equipment or TRX every morning. Exercise still is hard for me, as I have to power through the autonomic crisis that happens at the start. It is worst with cardio. I do it anyway. Waking up my core and getting stabling muscles engaged and firing is the best way for this hypermobile person to start the day. Doctors get attacked by us on Facebook and The Toxic for suggesting patients lose weight and exercise. I don’t understand. It is not their fault that those are powerful modalities that no drug can ever replace. Exercise stimulates my brain, so I am less of a klutz, safer during the day, preventing injury. My wacky nervous system needs reminding to do its job. I do not stretch. Collagen-typicals should stretch, but I have found that using my body as recommended in the Gokhale Method gives me enough muscle lengthening. No need to tug on my joints further. I want to be less flexible. I have a job where I am always on my feet. It makes my body feel so good. Can you imagine? I walked 3.6 miles at work the other day. I run up the stairs for a little extra workout, to get an invigorating spike in my metabolism, a little extra fat burn, a little glute strengthening. Can you imagine? And I do it in cute shoes. 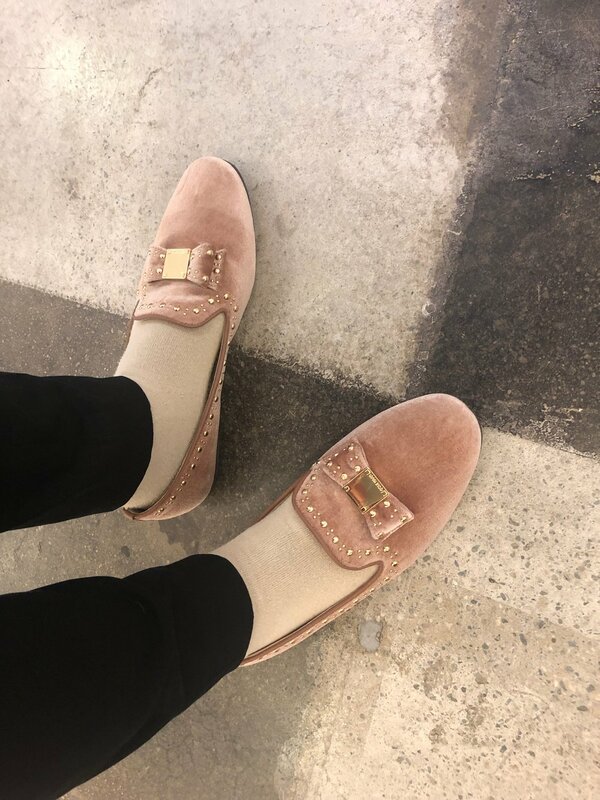 These fabulous Cole Haan’s make me want to put on a gray wig and play a harpsichord. If not for writing on my blog, I would hardly think about it. Except PTSD phenomenon forces it on me. I am haunted by my old, disabled life. Where is the support group for people who got out of prison for a crime they did not commit? I look so healthy and strong, and my beautiful EDS skin is holding up so well, it confuses people if I tell them I spent most of my life too sick to get out of bed. So I don’t mention it. I say yes to every invitation. Especially if it is dancing. I always show up. I never crash. Trying so hard has been worth it. It’s good to be able to live. The most important moment of my life was when I met Dr. Plance. He refused to give up on me. He refused to think that I was hopeless. Another great day of my life was when Ascor became a patented drug. Before that I was buying ascorbic acid compounded and lived in fear that I would lose access to it.